Why a modified 40ft container store was the best option for this business – and it might be for you too. A successful vehicle parts company in Suffolk already had a 40ft container store and wanted to place another on top. But why did they need modifications made to the container, and how did it help them achieve an ideal storage solution? Forklift access to the top level 40ft store was needed. The business wanted to be able to load and unload pallets in and out of the unit, but using standard shipping container doors to allow forklift access to the second level was not really ideal for 2 reasons. Firstly, since the container store was to be located on the second level it would have been cumbersome for employees to close the doors after forklift loading or unloading. Also, in the case of doors opening inwards it would have a consequence of reducing the amount of storage space available inside the container. The customer decided that the most effective way to move forward would be to fit roller shutter doors. This would mean employees could easily open and close the forklift access point door, and there would be no loss of storage area within the 40ft container store. 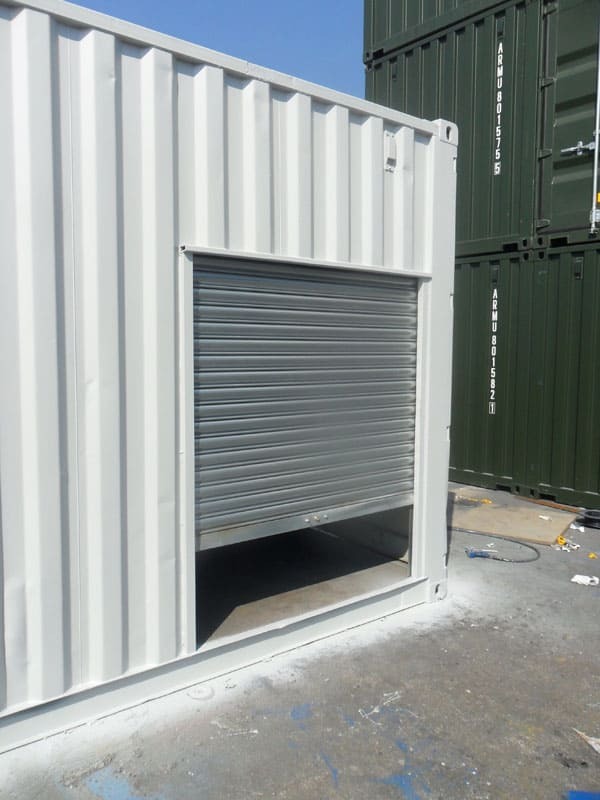 Stairs and a platform for personnel access would also fitted to the double door end of the container. Easier access. The roller shutter door was ideal in this case. Fully optimising the 40ft container store space inside. As you know, the business had very limited storage space within their yard so needed to make the best possible use of internal space within the box. 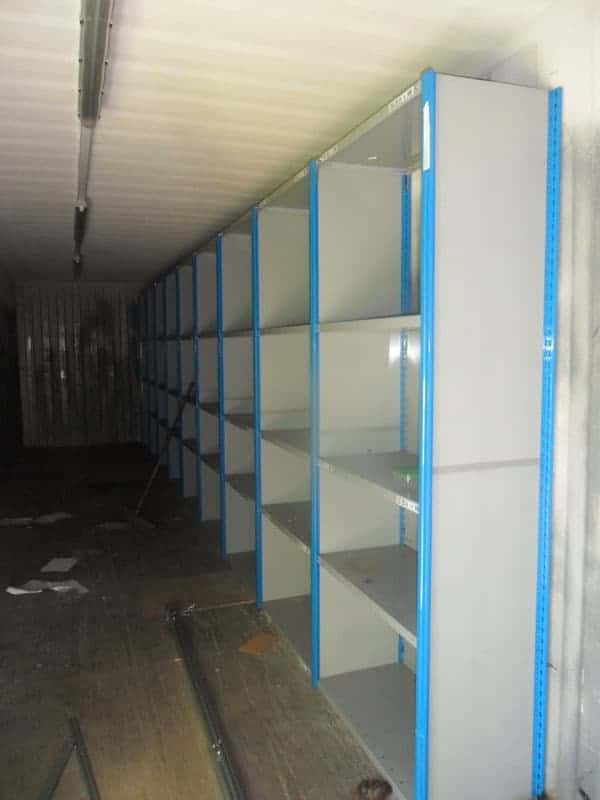 By installing racking against the 40ft container store walls it would mean that the floor space inside was maximised, and would also help employees to be more efficient in quickly locating stock. The durable steel racking fitted was adjustable, which meant that the customer’s stock could be placed onto the shelves regardless of size. Shelving: More floor space and employees can find stock faster. LED lighting in the store. Once the container had been re-painted it was time to add LED lighting, which was the customers preference in this case. So, what are some of the advantages of LED lighting? Essentially, over time LED lights are more economical compared to incandescent lighting. According to sources on Wikipedia there’s up to 75% savings per 860 lumens (a measure of light emitted). Considered more energy efficient than incandescent lighting. Life span of lights is generally longer. 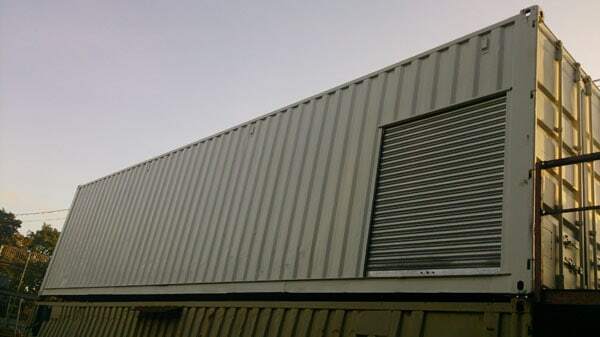 Used 40ft container with roller shutter door, shelving and energy efficient LED lighting fitted. Learn more about buying or hiring your own container store. Containers are hugely popular as a way of easily creating extra store space, without having to spend too much. Even if you’ve got very limited space containers can be stacked, and access points engineered, to meet your needs. A 40ft container store is just one of several box sizes in stock. You can also buy and hire 10ft, 20ft, 45ft, or even custom sizes.